God doesn’t call everybody to drive a forty-five-foot-long double-decker bus. That’s probably a good thing. But Jonathan Secrest was not just called to drive a bus. He was also called out of a career in youth ministry to steer a bus ministry toward a brighter future as its director. Unconventional? Perhaps. But not at all unqualified. Jonathan’s journey of experiences has prepared him for this moment, and opportunities to reach the lost and strengthen the believer abound around every curve. Changing gears isn’t always the smoothest thing to do, especially if you don’t know what may lay ahead. For Jonathan, the road of life has taken him to places he never would have dreamed about, but each one beautiful in its own right. For five years, he worked as a housefather and then dean of students at a therapeutic boarding school. After God paved the way for him to serve First Church of God in Marion, Indiana, as a bivocational youth pastor, Jonathan also realized God was calling him into full-time youth ministry. Following three years in Marion, the journey brought Jonathan into the hills of West Virginia for youth leadership at Teays Valley Church of God. While at Teays Valley, Jonathan completed his M.A. in executive leadership, but had no idea where he would use that education. The basis of Lightrider Ministries is simple: provide retreat or getaway opportunities for youth ministries, church boards, senior adult groups, and much more, all in a relaxed environment where ministry and spiritual growth is encouraged. While they currently offer to host groups with their own leadership and retreat plans, Lightrider hopes to expand and offer a fully-staffed getaway in the next couple of years—what they refer to as a “camp-on-wheels” experience. Retreats generally originate within a five-hour radius of the ministry base of Upland, Indiana, in order to ensure a cost-effective experience. In the future, Jonathan sees new offices opening up across the country so more churches and ministry organizations can take advantage of the kind of unique services Lightrider offers. The luxurious camp-on-wheels offers multiple flat-screen televisions, CD/DVD, two stories, and seats that convert to bunk beds. 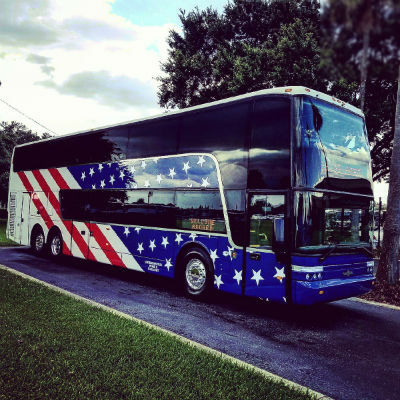 From missions trips and work camps, to a retreat to the Ark Encounter and Creation Museum near Cincinnati, Lightrider Ministries has already illuminated the way to a new kind of church transportation. Jonathan, who is also now serving as lead pastor of First Church of God in Marion, Indiana, looks forward to more pages unfolding in this new chapter of his ministry adventure. Learn more about Lightrider Ministries at www.lightrider.org. 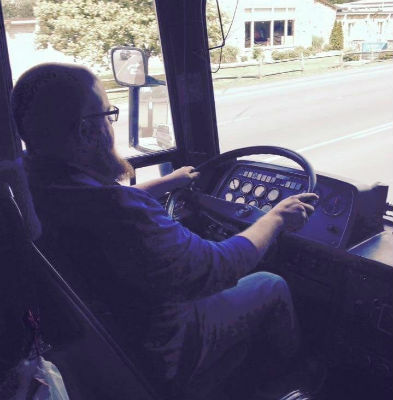 This entry was posted in All Church of God, Great Lakes and tagged bus, camp, First Church of God, getaways, Indiana, Jonathan Secrest, Lightrider Ministries, Marion, retreats, Teays Valley Church of God, Upland, West Virginia, youth ministry. Bookmark the permalink.